As retired ballroom dance champions we know how to put on a show. We see the chair covers and linens very much as we would a beautiful dance dress, always wanting to create an individual and exceptional look. As we have grown up in the event industry and organized many balls and banquets ourselves we know exactly how important your event is to you and we pride ourselves on the products and service we offer. Our all inclusive price takes the stress and worry away from you. We will liaise with the venue direct to set up the chair covers, sashes and any other decorations that you have selected. When the party is over, again we will liaise with the venue to collect our products. All you have to do is to choose which chair covers, sashes and other accessories you may require and give us all the relevant details such as venue address, date of the event, and approximate number of guests. 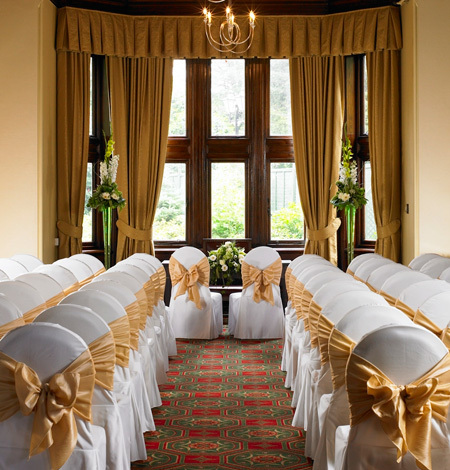 We appreciate that guest numbers will not be exact until nearer the time and are happy to adjust accordingly.Alternatively we can offer our DIY service where our driver or courier take and collect the chair covers and sashes to the venue and you can arrange for the set up to be done independently. The chair covers and sashes also need to be packed up by yourselves at the end of the event in order for the driver or courier service to return them back to us. To save on courier fees you are welcome to collect and return direct from our premises. Please contact us for further information on how we can best assist you for your event. If you are interested in hiring our products then please either send us an email info@chaircoversandmore.co.uk or phone us 01328 853018.